I love candy as much as the next person, but with everything the kids will get at school or from friends, I try to keep my gifts something different and maybe more healthy. This is a craft I created and one of those ah -ha! moments like I could get rich and famous on it… only to find out from google that someone else had the same idea. Sigh. Well, I’ll keep trying to come up with something that will make me rich and not-so-famous-I-get-stalked. This cost me a total of $1.68 at Joann’s. You can get as simple or creative as you like. I made this with a heart-shaped cookie cutter. I want to make another one next month with my shamrock cookie cutter. I bought a 100 pack or so of cookie cutters years ago for like $5. 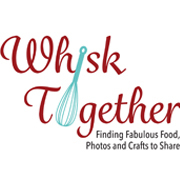 You could make an apron, oven mitt, kitchen towel, their own rolling pin, their own chef’s hat, use their name as the letters for the cookie cutters, use different shapes throughout one sheet of felt, etc. The expansion pack is endless! But if you do want some calories for Valentine’s, check out the Chocolate Covered Strawberry Cake I made in November. 1. 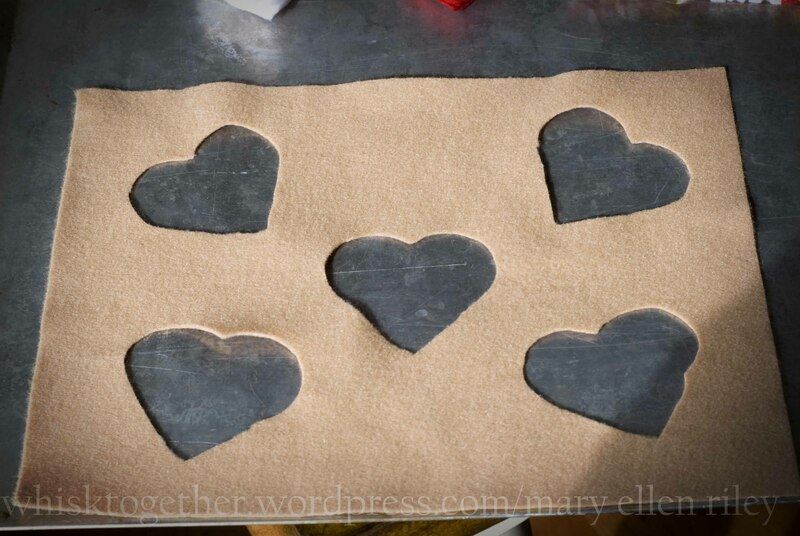 Using a pen, trace the cookie cutter onto the brown felt. 2. 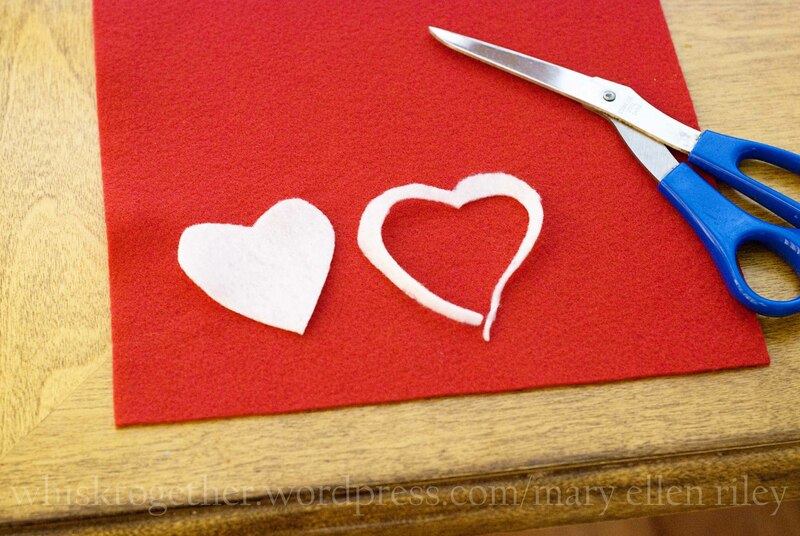 Using scissors, cut out the shapes keeping the inside shape intact. In other words, you need to cut them directly starting on the line (as shown in photo) and don’t cut from the outside like you normally would. 3. 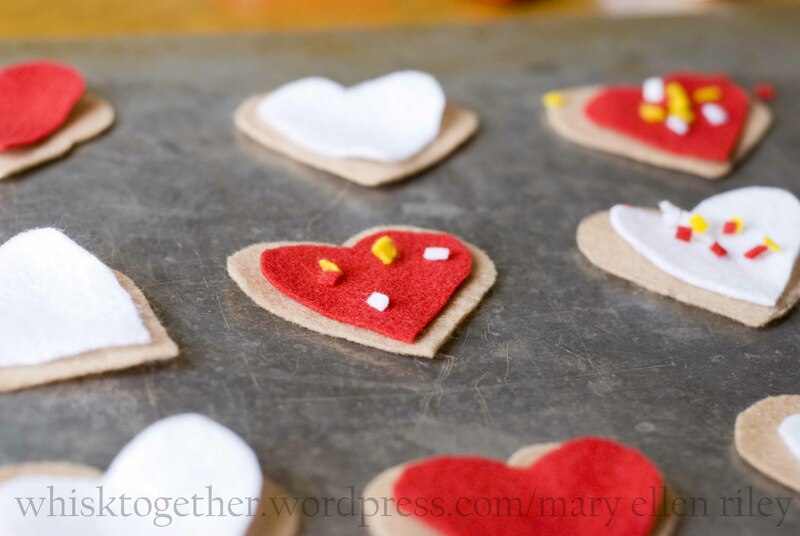 Using one of the “cookies” as a guide, cut the same shape onto the icing/contrasting color felt. Then, I just eyeballed it and cut about 1/4″ smaller around the shape. 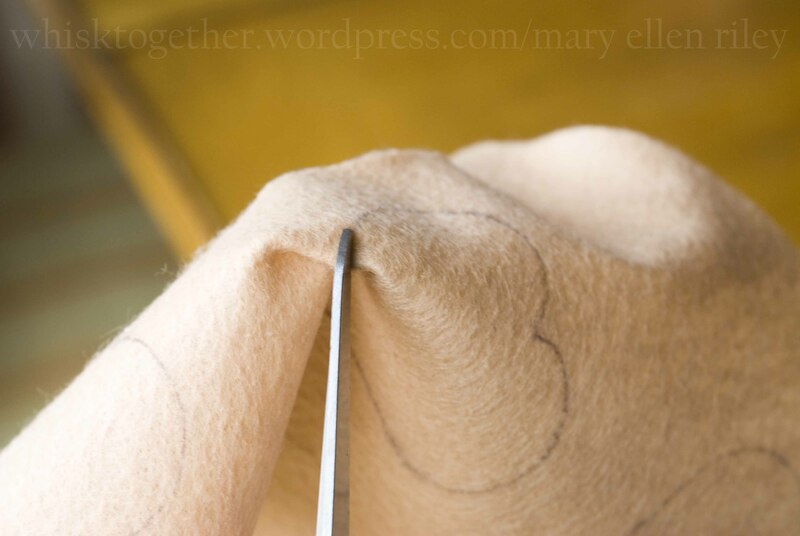 I took this smaller shape and used it as a guide to cut the rest on the felt. It was much easier to pin the shape to the felt and cut around it. That way it didn’t move as much when I was cutting the felt. Make as many as you like. I made 5 of red and 5 of white because I had 10 cookies. 4. 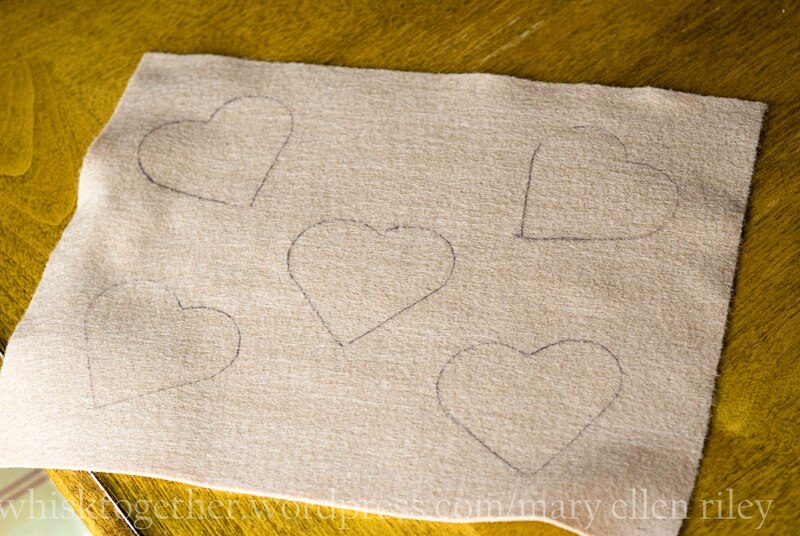 When you are finished, if you used two different colors for the “icing” felt hearts, cut small 1/4″x1/4″ squares from them. 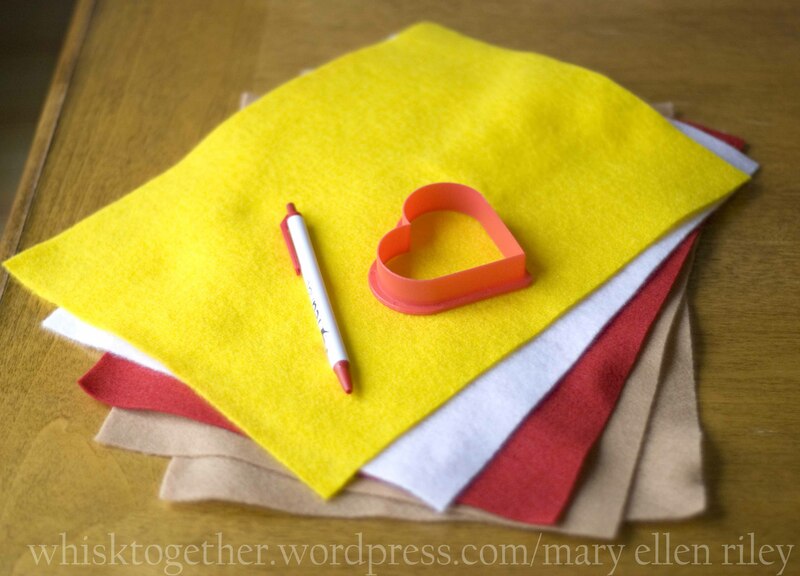 Cut the same squares out of any contrasting material you purchased as well (I used yellow). These will be the sprinkles. 5. I packaged my craft in ziplock bags for travel. You could do this with a gladlock container. When I give it to the kids, I’ll have out my cookie sheet, rolling pin and spatula to make the “cookies” with. 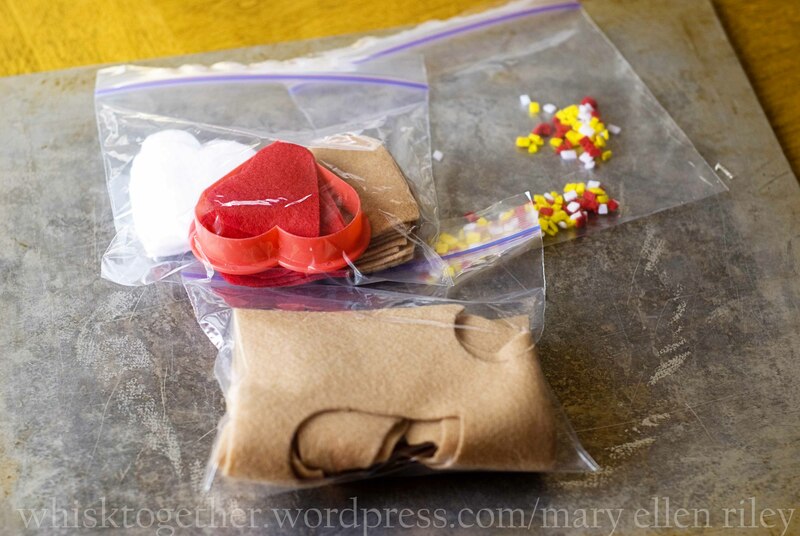 Great idea…pined it to make on a rainy day with my four year old. I love this! Thanks for sharing! Happy V-Day!